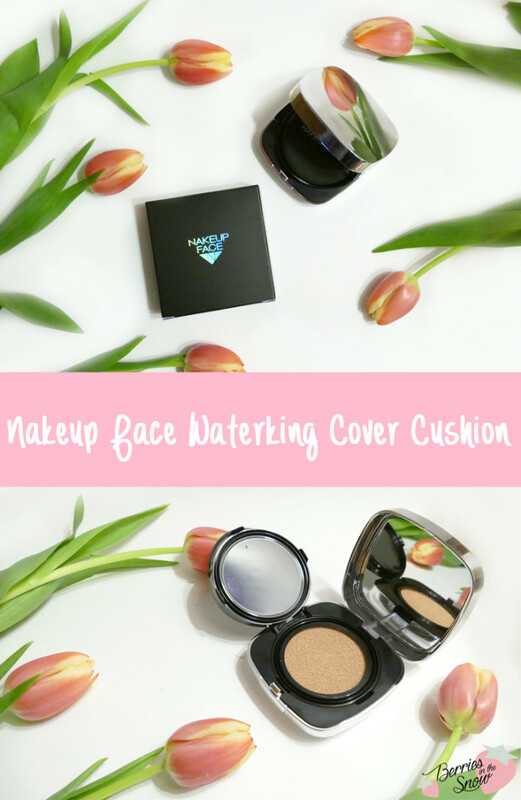 This is the product from the second round of products by TesterKorea I’m most excited to review, because of its reputation: the Nakeup Face Waterking Cover Cushion! It is also the last product from TesterKorea as 1st Real Tester. I hope you enjoyed the couple of reviews I shared and if you missed them out check my list at the end of this post. First, some information about TesterKorea: if you know me and my blog for some time you will know that TesterKorea is my favorite online retailer for larger Kbeauty hauls. I’ve purchased products from them many times and they never failed me. Also, they are quite popular for offering many free samples and having a LARGE variety of samples for sale aswell. If you do not know a specific products and you want to test it first the place to recommend is TesterKorea. Also, they have a huge amount of different products from many brands, so you can be sure to find what you are looking for in most cases. Unlike other online retailers they do not offer free shipping, though, but their shipping is based on weight. The cheap prices of the products themselves totally balances the shipping costs in my eyes – especially for larger hauls. They even have a specific topic where you can request a product, if it is newly launched. They are also quite fast in listing the latest products from most brands. Considering the fact that I know they are a reliable retailer and have a good reputation makes me even more happy that I’m part of the 17 members of their 1st Real Tester round-up. I linked my previous reviews at the end of this post. Nakeup Face is a Korean brand which is very new to me. I still cannot believe how many Korean cosmetic brands exist…It seems I’m always discovering a new brand. The brand name is a combination of Naked Face and No Makeup. Nakeup Face products should allow you to achieve a natural look and on the same time recover your face in a way that you feel comfortable with your naked face. They seem to have gained quite some popularity in Korea and there are some magazine appearances as well, according to the description of the Nakeup Face Waterking Cover Cushion. The Waterking Cover Cushion is a hydrating cushion foundation for creating flawless and radiant skin. 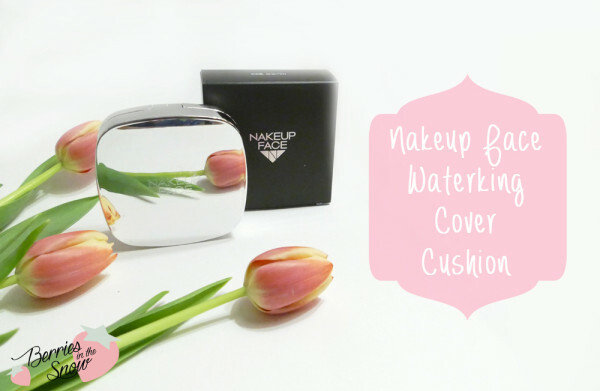 The square-shaped cushion compact of the Nakeup Face Waterking Cover Cushion comes packed in a cardboard box. 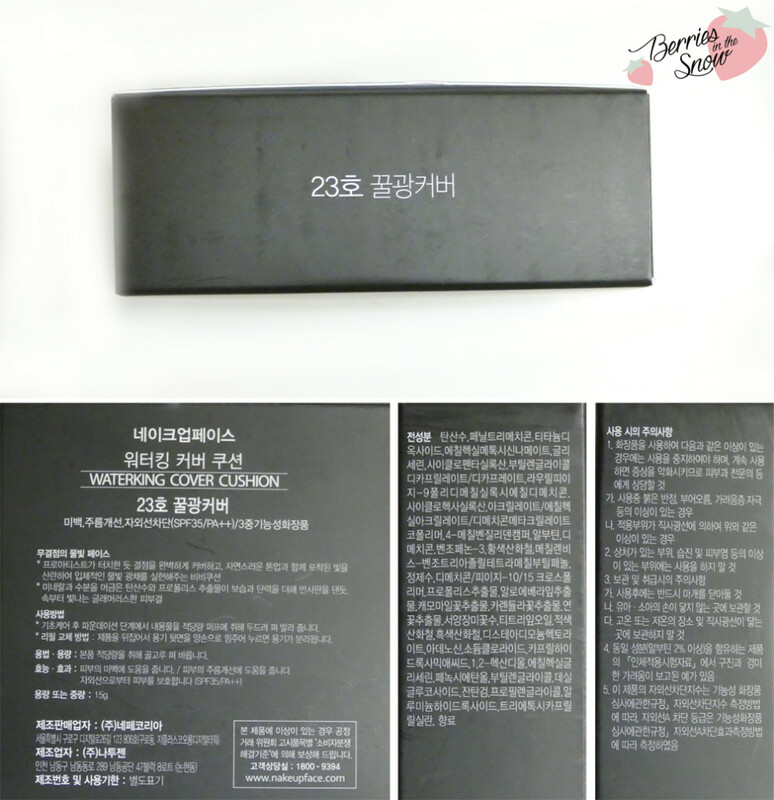 The box contains Korean description only and unfortunately I do not have much information about the ingredients of the cushion. The key ingredients are propolis extract (vitalizing), aloe vera extract (moisturizing), rose-water (smoothing), and lotus extract (brightening). It also contains mineral water and has SPF 35 / PA++. Unlike other cushions the shape of this cushion compact is not round but square. It also has a silver material, making it also useable as mirror when closed. You will find a mirror on the inside of the lid as well. 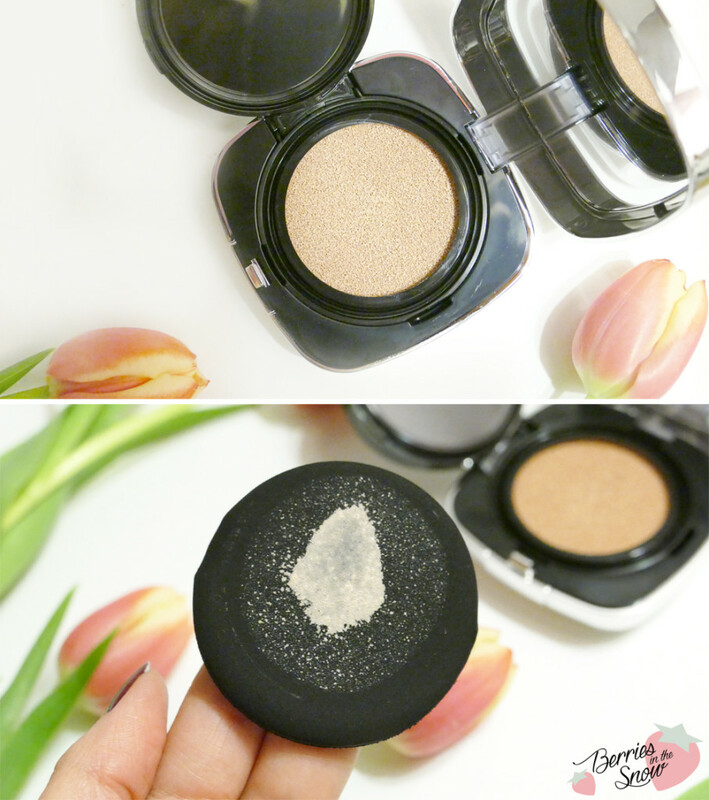 Cushion foundations consist of a cushion soaked with the foundation / bb cream and a sponge /puff applicator which you press on the cushion in order to apply the foundation on your skin. 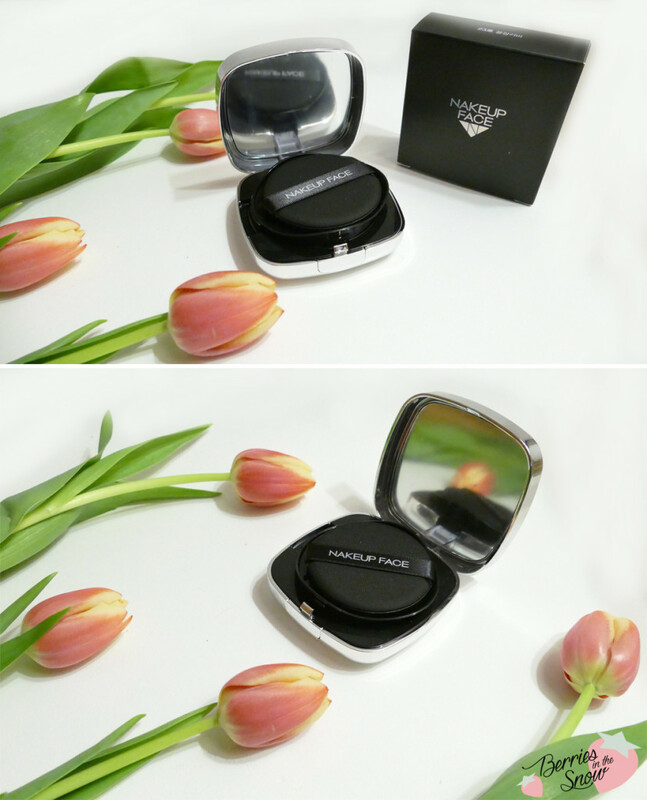 The sponge for applying the foundation is a rubycell sponge with a black color. It has a dense structure and antibacterial properties. I would advise you to wash your sponge after a while or exchange it with a new one (there are plenty of sponges available online). I think the square shape and the silver and black colors make this cushion look very luxurious and mature. I really like the design, although it is simple. The shade I’m showing you here is No. 23. There is a lighter color available as well, but 23 fits my skin color quite well. The container with the cushion can be removed from the case and there are refills available for this cushion. The foundation is very creamy and by pressing lightly you will already receive more than enough of the product. The foundation has a rose scent, which I absolutely adore. It is not too strong, but very light. The plastic lid of the cushion container closes very tightly and keeps the cushion from drying out too quickly. 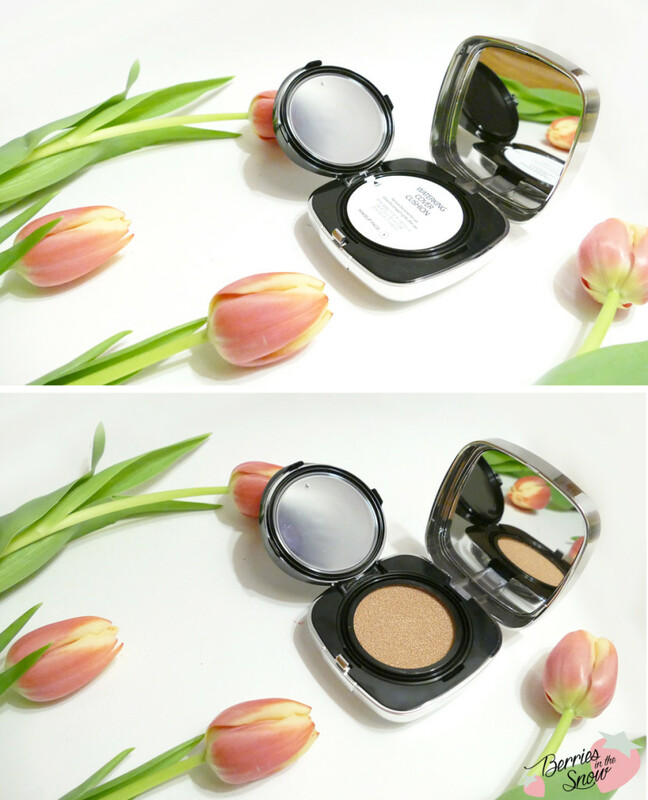 The Nakeup Face Waterking Cover Cushion has a medium coverage, which is buildable up to high coverage. It can be build up without a caking effect and this is also the claim it has. It combines foundation, concealer, and essence. Although it looks matte on the image below I would consider it to be semi-dewy, leaving a natural, but very pretty glow to the skin. It contains pearl particles for diffusing the light from any angle. My pictures really do not do the product enough justice here. The finish is really pretty and since it is semi-matte/ semi-dewy it is not as sticky as some other dewy cushions would be. You will feel a very slight tackyness, but it is hardly noticeable. 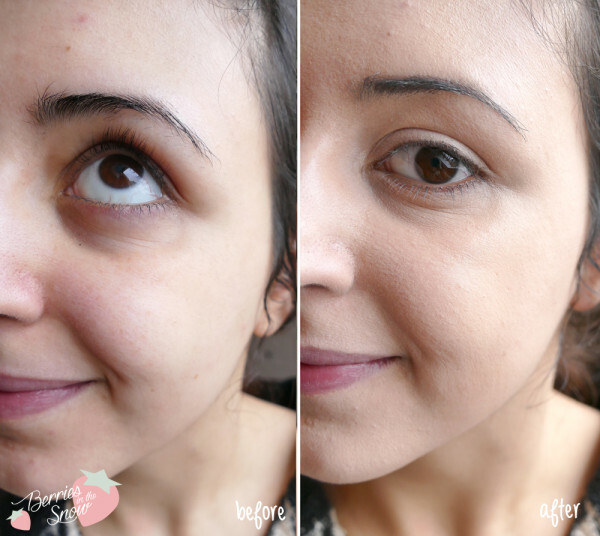 The foundation covers up rednesses really good, and I even could use this on my dark circles. It needs touching up after some hours, especially around the nose and smilelines, so it is not 24 h lasting, but I didn’t expect that anyways :D It does not make the skin feel dry though. I didn’t expect this cushion to be very special, but actually I really enjoy using this one. I’m using it quite often and I really like the semi-dewy finish and how it looks when freshly applied. Also, it has a really good coverage. 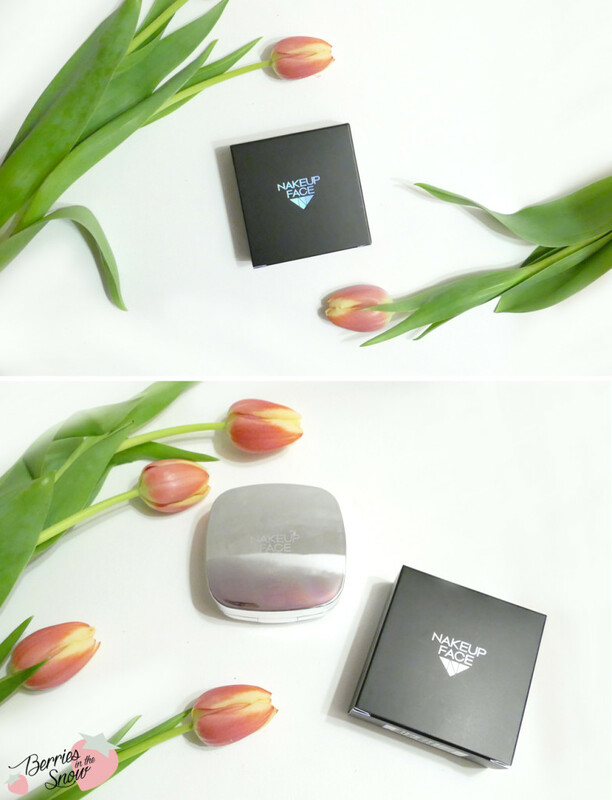 The packaging design is also really pretty and I like to have this elegant looking cushion compact in my collection. The cushion contains 15 g and retails for 19600 Won (~16.61 US$) at TesterKorea. You can also get it together with a refill for 31600 Won (~26.77 US$). Did you know the brand Nakeup Face? What are your impressions? 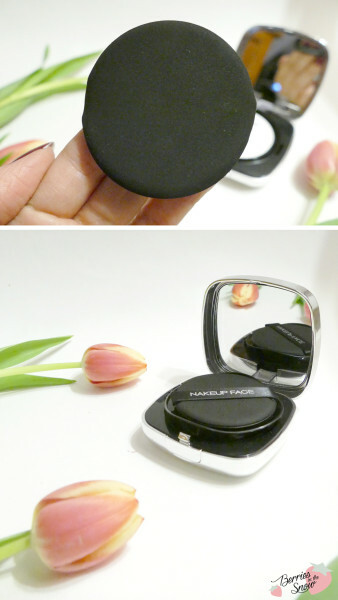 I love the reflective compact case — it’s so pretty! I also really like how it looks on your skin because it’s not cakey at all but still has high coverage. :) Now if only they made this in more shades! Mary+Vu last post…REVIEW: Kicho Ultra Moisturizing Sun Cream SPF 50+ PA+++ (And NEW K-Beauty Store: OHLOLLY)!